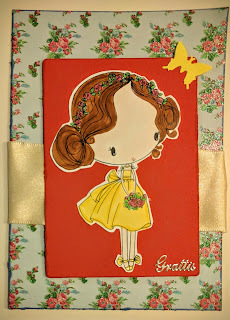 This cute girl, who I have colored with Pro-and Flexmarkers and a bit of glitter, is participating in these challenges: All Dressed Up (ATG), I love Promarkers (For a Child), The Paper Shelter (Birthday Girl), Crafter's Café (Something for a Child), Penny's (ATG) and Simon Says Wednesday (Add some shimmer: the background paper has a little bit of glitter in it, and then I added some to the flowers in the girls hair & hands as well as the shoes). Jessi, your card is super sweet! Great coloring and I love the background paper! Thanks for joining us at the Crafter's Café! Your card is darling! The image and you design are so sweet. Thank you for playing with us at The Paper Shelter. Best of luck to you! Lovely hot summer colours, and beautiful design paper! hello Jessi! super cute card, luv the background papers! I am so glad you played along with us at simon says stamp wednesday challenge! This is such a sweet card Jessi! adorable image and lovely summer colours. Brilliant card, love it. Thank you for joining us over on thehILP challenge this week.